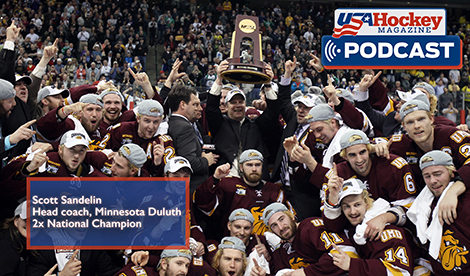 This podcast features University of Minnesota Duluth Head coach Scott Sandelin. The Hibbing, Minn., native talks to us about this year's group creating their own identity after last year's National Championship winning squad, how the game is changing, and the World Juniors, where Sandelin will serve as an assistant coach for the U.S. and much more in the latest episode of the USA Hockey Magazine Podcast. Follow us on Facebook, Instagram, and Twitter for more from USA Hockey Magazine. Stay tuned for our next podcast, which goes live Thursday, Nov. 22.